We are a prominent name in this business, providing Demolition Work Service to customers. To get the total satisfaction of the customers, we provide this service at most reasonable price. 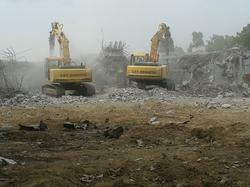 We are one of the leading service providers of RCC Demolition. The offered RCC Demolition Services is carried out to demolish the concrete and rock structures. Our offered RCC Demolition Services is executed by the most experienced and trained professionals of the trade. The offered RCC Demolition Services is available at very competitive market rates. Note : Prices of services are for promotion purposes and it will depends upon BUYER Requirement. Building Demolition Services is the tearing-down of buildings and other structures. Demolition contrasts with deconstruction, which involves taking a building apart while carefully preserving valuable elements for re-use. For small buildings, such as houses, that are only two or three stories high, demolition is a rather simple process. The building is pulled down either manually or mechanically using large hydraulic equipment: elevated work platforms, cranes, excavators or bulldozers. Larger buildings may require the use of a wrecking ball, a heavy weight on a cable that is swung by a crane into the side of the buildings. Newer methods may use rotational hydraulic shears and silenced rock-breakers attached to excavators to cut or break through wood, steel, and concrete. The use of shears is especially common when flame cutting would be dangerous. 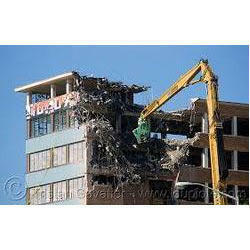 We are one of the leading service providers of Demolition Work Services. 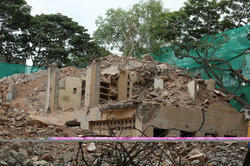 The offered Demolition Work Services is carried out to demolish the concrete and rock structures. Our offered Demolition Work Services is executed by the most experienced and trained professionals of the trade. The offered Demolition Work Services is available at very competitive market rates. Searching for a trustworthy company that provides Concrete Demolition Services. If your answer is in affirmative, count on us. We have highly experienced and skilled supervisors and technicians who provide safe demolition of building slabs and columns. We employ manual operated pneumatic breakers and electrical chipping machines while providing Concrete Demolition Services. 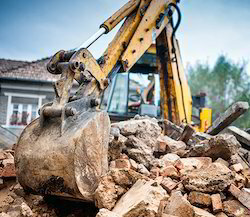 By providing excellent Concrete Demolition Services, we have become the first choice for the clients when it comes to obtaining these services. We feel proud to introduce ourselves as the well-known service provider of Building Demolition Services. The offered Building Demolition Services includes the tasks for bringing down, old buildings, factories and commercial premises. Our offered building demolition service is rendered by the experts of the trade. The offered Building Demolition Services is available at very affordable market rates. Looking for Demolition Work Service ?